LOS ANGELES--(BUSINESS WIRE)-- HemaCare Corp. (OTCMKTS: HEMA), a global leader and trusted brand in the customization of human-derived biological products and services for biomedical research, drug discovery, and cellular therapy process development, today announced the company has moved its global headquarters to Northridge, California. 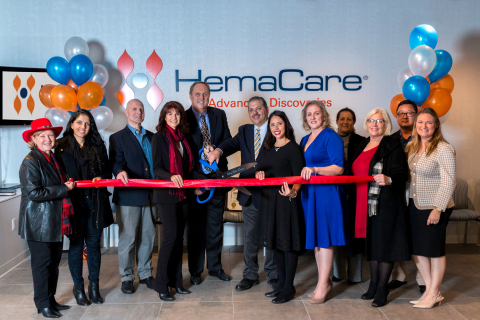 In this new facility, HemaCare more than doubles its donor collection capacity and on-site cell processing capabilities. Located at the 44-acre Harman Campus, in the heart of the San Fernando Valley, the 40,000-square-foot newly renovated facility reflects the company’s accelerated growth. The cell therapy industry continues to see a rapid increase in demand for high-quality starting material. HemaCare has become the number one most trusted supplier of human biological material for cell therapy customers around the world. This trust was earned by consistently maintaining the highest quality standards, a consultative approach, and customization to meet unique process development needs. With four GMP clean rooms, the facility has been designed to accommodate HemaCare’s specialized cell collection and processing equipment to support clinical and commercial drug development. HemaCare’s on-site GMP facility processing capabilities include cell collection, cell washing and isolation/separation, controlled-rate freezing for cryopreservation, and biorepository services for controlled storage. Adding expanded GMP capabilities to HemaCare’s industry-leading knowledge and experience will further propel their ability to partner with regenerative medicine and cell therapy companies. HemaCare’s new state-of-the-art facility is expertly designed to enable a seamless transition from donor recruitment and collection to the downstream processing, storage, and subsequent transport of the cell therapy starting materials. The additional space positions HemaCare for scalability and significantly increased technical capabilities necessary to meet the rapidly growing number of requests for high-quality, consistent cell therapy starting material. For more information about HemaCare, please check out our new website at www.hemacare.com. HemaCare is a global leader in the customization of human-derived biological products and services for biomedical research, drug discovery and cellular therapy process development. The company’s network of FDA-registered, GMP/GTP-compliant collection centers ensure fresh donor material is available to customers and for use within HemaCare’s isolation laboratory. Human biological material including peripheral blood, bone marrow, and cord blood is isolated into various primary cells types for fresh and frozen distribution. For 40 years, HemaCare has developed an extensive registry of repeat donors and provides human-derived primary blood cells and tissues for biomedical and drug discovery research and cell therapy clinical trials, and supports commercialization with apheresis collections, directly enabling customers to advance both autologous and allogeneic cellular therapies.